If you find yourself in Thailand, it’s not a bad place to be. The food is good, the beaches are good, and you can knock yourself out doing anything from watching elephants paint or training in Muay Thai. But after thirty days we were ready to head to the next country. (Maybe one with a few less lady boys). We planned for a month assuming that was how long our Visa would last, but it turned out that since we got it in Penang instead of on-arrival that we had two months. Still, it wasn’t worth staying. Laos was so close. Okay, close is relative when using Asian busses. We got a bus from Chiang Mai to Chiang Rai. we showed up at 9:45 for a 10am bus that both our guesthouse and our online research said would depart from the station. No one mentioned the long lines that don’t move. We stood there trying to figure out if there was anyway to check if there was availability before the bus left. We went to the information desk and they told us they don’t have any of the bus timetables. I was curious to know what they DID have information on if not that. There was one French couple at the front of the line among all the locals who told us that they had been waiting since 9am. They were told the next bus leaves at 12:30. This is exactly why we were on our way to Chiang Rai and not Chiang Kong where the border is. See, the ride to Chiang Rai (the capital of the Province of the same name) is 4 hours, but the ride to Chiang Khong (where there isn’t much) was 6 hours. You can cross the border until 5pm. But conspicuously, the busses from Chiang Mai always seem to make it too late so you have to spend the night in Chiang Khong. 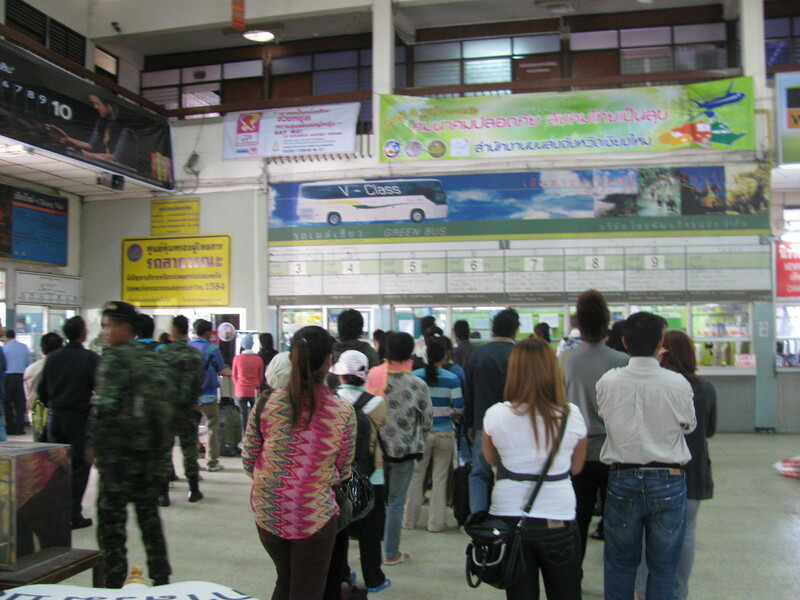 So we opted to check out Chiang Rai, and take a morning bus to the the border the next day. 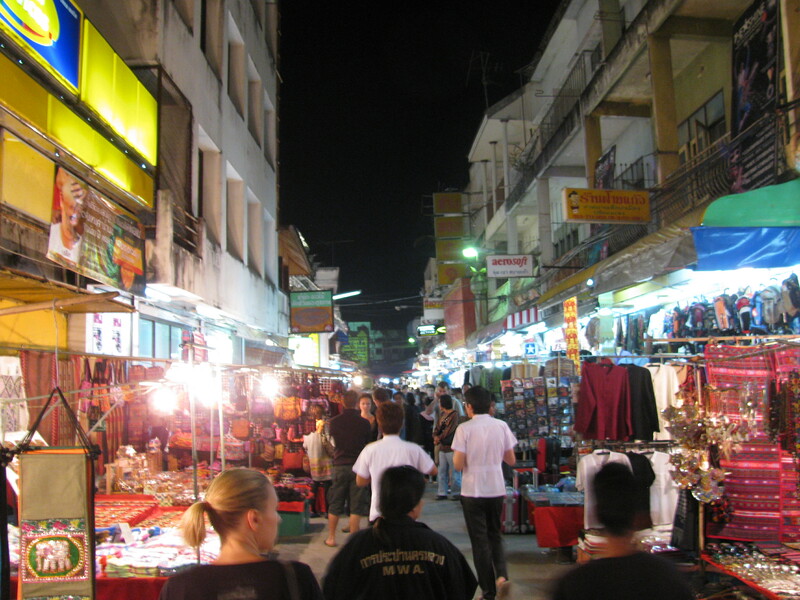 Our day in Chaing Rai turned into just the night since we arrived at 5pm instead of 2pm, but we made the most of it. The next day we had no trouble catching the bus to Chiang Khong. We arrived, and a tuk tuk drove us as far as he could go before we had to walk. We looked out, and it was a great feeling. There was a river, and on the other side it looked like it was just another town, but we were looking at a whole new country. We stamped out of Thailand and got in a long boat that sputtered to the other side where there was a wooden building where we could obtain our Visa. While we were waiting I walked into town to become a Mllionare (withdrawing 2 million kip from the ATM). There wasn’t anyone to stop me from coming into the country without the Visa. We were in Huay Xai, a sleepy town that didn’t seem to care one way or another about tourists. 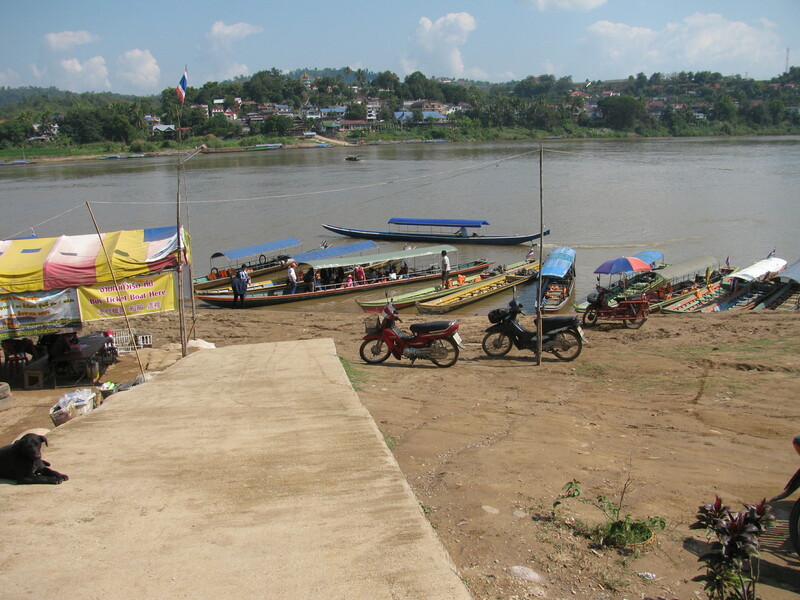 It had about 6 places to sleep and 4 restaurants, but it was Laos. Where they say Chai-lai-la-lai (thank you very much), and serve up Mok Khao and sticky rice instead of Pad Thai. Surprized you guys spent so much time in Thailand, but now you’re in Laos … or perhaps moved on from there. 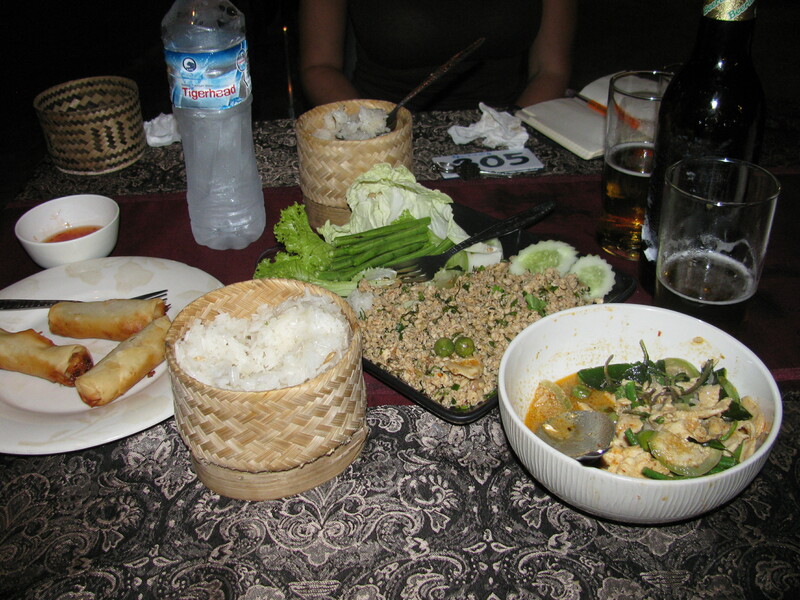 Laos was a fave of ours. Homesick just a tad yet ? Yes. All the posts are song references actually.